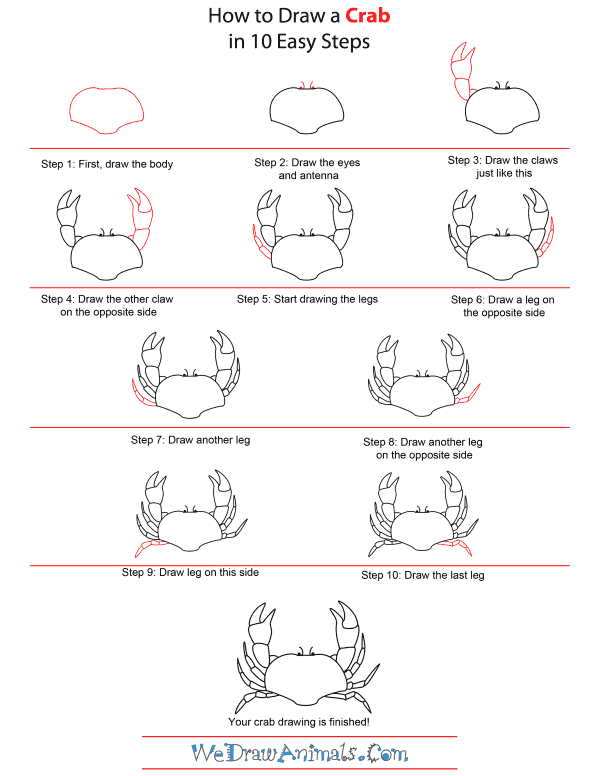 In this quick tutorial you'll learn how to draw a Crab in 10 easy steps - great for kids and novice artists. At the bottom you can read some interesting facts about the Crab. Step 1: First draw the body. The top is round. 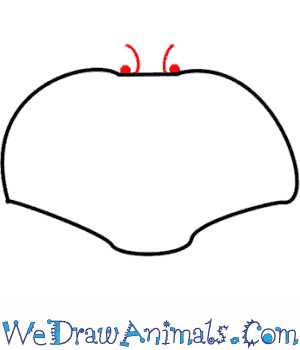 The bottom of the body has two slight curves on the sides with a downward bump in between them. Step 2: Next draw the tiny eyes and the two tiny antennae. They are all at the top middle of the head. Step 3: Now we draw the front left claw. There are three parts. 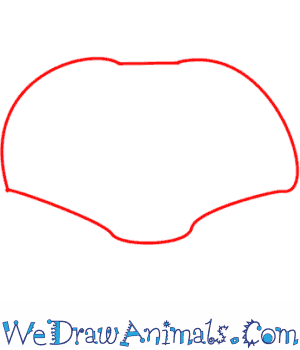 The first part joins with the top left of the body and is slightly triangle shaped. Make sure you make the two tips very pointy. 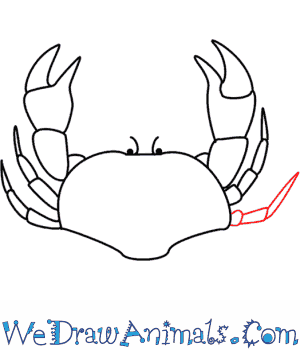 Step 4: Draw the other front claw on the other side of the top of the head. Make it the mirror image of the left claw. Step 5: Now we start drawing the legs. The front leg begins at the left side of the body. It has three long thin segments that curve up along the claw. It is much thinner than the claw. Step 6: Next we add the front leg on the right side. It is the same length as the other leg but has four long thin segments. Step 7: Add another leg to the left side, right below the first leg. Make it the same length and shape as the first leg. Step 8: Draw another leg on the right side. Make it the same size and angle as the first leg. Step 9: The last of the left legs is right behind the other two legs. It has four segments and curves down. Step 10: Add the last leg on the left side of the body. It also has four segments and points down. 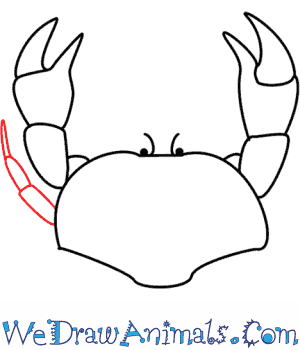 Crabs are part of the large family, arthropods, whose relatives include shrimp, crayfish, lobsters, barnacles and krill. Fossils of crabs date back to the Jurassic period, with about 850 species living throughout tropical and sub-tropical regions of the earth. Because of the way a crabs legs are designed, they usually walk side-ways. 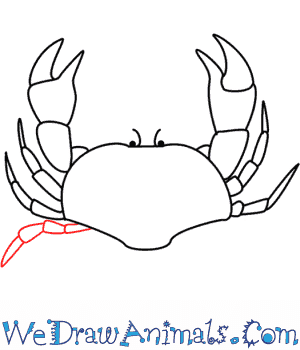 Crabs primarily eat algae, but will eat worms, fungi and bacteria, mollusks and shrimp. Because of their tasty meat, crabs are farmed, caught and eaten worldwide. 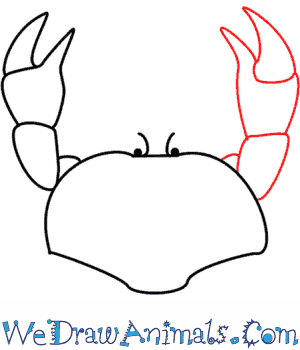 Crabs communicate by beating or waving their pincers. Being often aggressive to one another, male crabs will fight for access to female crabs and crabs will fight over hiding places. Crabs, despite their aggressive nature, will work together to provide protection and food for their family, or to find a comfortable place to lay eggs. 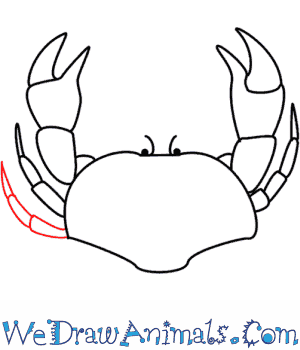 Other animals have crab-like names, such as the horseshoe crab, the hermit crab, the king and porcelain crabs and crab lice, but they are not true crabs. 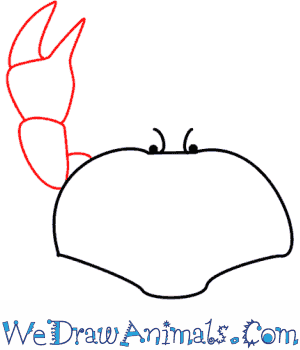 Ancient people of Peru were nature worshippers and often depicted the crab in their artwork. 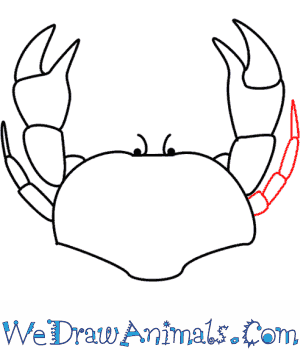 The astrological sign of Cancer represents the crab. 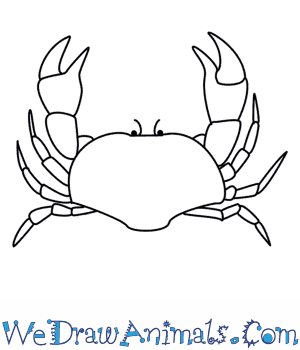 In Greek mythology the crab, Karkinos, was involved in a battle against Hercules.